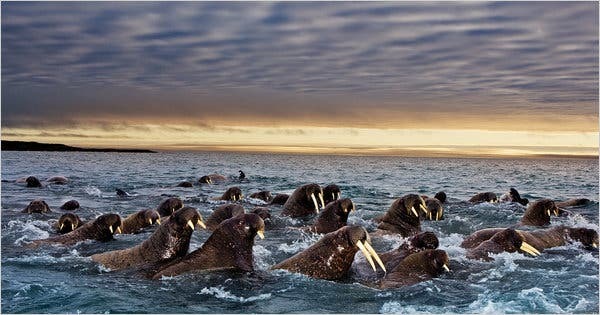 This stunning image of Alaska's annual walrus migration at top of page from the National Geographic mini-series, Great Migrations, underscores new research showing that global warming has no signs of slowing down and that further increases are to be expected in the next few decades. Scientists fear declining Arctic sea ice may have caused an unprecedented mass migration of thousands of walrus from the ice floes to dry land along Alaska's coast. Researchers from the US Geological Survey (USGS), who have been tracking walrus movements using satellite radio tags, say 10,000 to 20,000 of the animals, mainly mothers and calves, are congregating in tightly packed herds on the Alaskan side of the Chukchi Sea, in the first such known exodus of its kind. New research has clarified the global climate trend, proving that global warming is showing no signs of slowing down and that further increases are to be expected in the next few decades. The team –researchers, statisticians and climate experts from Tempo Analytics and the Potsdam Institute for Climate Impact Research– analyzed the five leading global temperature data sets, covering the period from 1979 to 2010, and factoring out three of the main factors that account for short-term fluctuations in global temperature: El Niño, volcanic eruptions and variations in the Sun's brightness. "Our approach shows that the idea that the global warming trend has slowed or even paused over the last decade or so is a groundless misconception. It shows that differences between the five data sets reside, to a large extent, in their short-term variability and not in the climatic trend. After the variability is removed, all five data sets are very similar," said study co-author Stefan Rahmstorf. After removing known short-term fluctuations they showed that the global temperature has increased by 0.5°C in the past 30 years. In all of the five global data sets, 2009 and 2010 were the two hottest years. In the average over all five data sets, 2010 is the hottest year on record. Their study comes at a time when global warming is at the forefront of the political agenda, with the United Nations Framework Convention on Climate Change (UNFCCC) currently taking place in Durban. By bringing together and analyzing the five records – three surface records and two lower-troposphere records – the researchers were able to clarify the discrepancies between each one and, when factoring out the naturally occurring variability, show the excellent agreement between all five data sets. "The unabated warming is powerful evidence that we can expect further temperature increase in the next few decades, emphasizing the urgency of confronting the human influence on the climate," says Grant Foster, lead author of the study.